Cohort 4 researchers Luke Wilkinson and Pete De’ath recently attended the Royal Society of Chemistry’s conference ‘Assessing & Managing Real Life Risks from Chemical Mixtures’ at Burlington House, London. The morning session consisted of two sections; ‘Human and Environmental Assessment of Mixtures – State of the Art Research’, and ‘Industry and Regulatory Approaches for the Management of Mixtures – State of the Art Tools’. The research section included presentations from Prof Stephen Holgate (University of Southampton) on why it is important to regulate chemical mixtures; Prof Greet Schoeters (VITO Belgium) on human biomonitoring and biomarkers and how they can be used to link exposure to environmental chemical mixtures; and Prof Paul Whitehead (Oxford University) on modelling and analysing mixtures in an aqueous environment. The second section consisted of presentations from Dr Tina Mehta (DOW Chemicals UK) on industry’s approach to assessing and managing chemical mixtures; Dr Stephanie Bopp (European Commission JRC, Italy) on the regulatory approach of assessing and managing chemical mixtures; and Prof Jacob van Klaveren (RIVN, Netherlands) on the future of European infrastructure of chemical mixture testing and assessment. While both sections were interesting, the first session being more research based was much more relevant and understandable. The second section was industry focused and was a lot more confusing as there were many undefined acronyms used, which made the presentations very hard to follow. The afternoon session consisted of 4 breakout sessions. The session we attended was ‘Bridging from Science to Risk Management for Decision Making’ and included a range of people from various scientific, regulatory and industrial backgrounds. While it was interesting to hear the ideas and procedures from each of the people present, it was very difficult to contribute much as the session was very industry focused. The most enjoyable part of the day was the start as the presentations were more interesting and relevant to our current research positions; however the later sessions were useful for exposure and an insight into areas outside of our current field. In this event we had the opportunity to speak with the end-users (general public) and discuss about their needs and opinions about having a robot in their home. During the event I got more comfortable about my PhD and what people think about that area. The company benefitted from suggestions of the customers, e.g. the robot feet look too bulky and in our next exhibition we made it smaller. At this event, the main aim was to meet future investors. I got experience talking with business and companies that need to make collaboration either for the end product or on-going research. We ran a demonstration to show potential investors the first steps of the project (literally, the first steps of our robot!). Since Innovate my co-sponsor has collaborated on a funding proposal with a new company who they met at the event so, they found a new collaborator and, potentially, new funding. Cohort 3 researhc Robin Hamer attended a one day event in partnership with the RAF’s human factors practitioners and the CIEHF. The event was very well run and was tailored more towards the aviation industry with a specific focus on military applications. Since RAF Odiham is the country base of the Chinook fleet, we were given a unique opportunity to have a tour of the Chinooks, the maintenance area and of the training simulator. It was good to see how proactive the RAF are with human factors and how they are continuously look to improve their human factors practises. The most useful part of the day consisted of the workshop whereby human factors specialists from RSSB came and presented their human factors taxonomy to attendees. This taxonomy was a way to identify contributory factors to accidents in an in-depth manner. We used this taxonomy on three case studies from the aviation industry and it proved very useful to find what goes wrong in organisational accidents, but what also goes right. It was also very good of RSSB to show everyone how to use this taxonomy properly. I can see this being very useful in my PhD as a starting point and I can already see how it can be developed for the nuclear industry. Although the taxonomy wasn’t perfect, it was a good starting point, so I am glad I managed to get my hands on it. All in all, the event was a success. I managed to obtain the documents I wanted too and managed to network with other human factors specialists not in my domain. Last week we were delighted to welcome Professor Shigeki Sugano from Waseda University in Japan last week. Professor Sugano gave a guest lecture as part of the CDT in Embedded Intelligence Foresight Series on mechanical intelligence for human-robot interactions. Following the lecture had the opportunity to tour department of Computer Science as well as the Autonomous Vehicle Lab, the Centre for Intelligent Automation and the Sports Technology Institute. Staff and students attended from across both partner Universites as the talk was streamed online. Professor Max Zecca, who is a Visiting Professor of Robotics at Waseda University, took the opportunity to promote the JSPS Summer Programme, which provided MPhil and PhD students the oppportunity to a fully paid internship at a host institution in Japan for 2 months. I had the great honour to be awarded with an Armourers & Braziers travel award, to attend the SAMPE Europe Conference 2017. SAMPE is a general organization devoted to the promotion of technical excellence in materials and process engineering, totalling around 15,000 engineers, technologists and materials scientists. 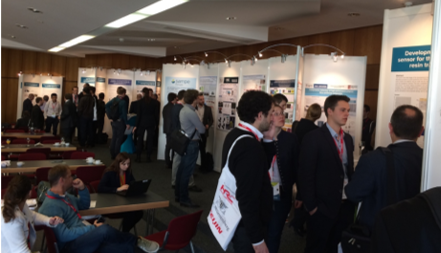 The conference took place in Stuttgart, Germany from 15 to 16 November. The conference covered an expansive list of subjects regarding lightweight materials and their processing. The conference commenced with keynote presentations of BMW on "Multifunctional Materials for Aeronautics and Space" presented by Dr. Gunnar Rieber and Lufthansa Technik on "More mobility for composite aircraft” by Dr. Christian Sauer. The first day was concluded with tours of AUDI, Porsche, DITF, Trumpf and Fraunhofer ICT. The second day more than 64 professional speakers from both industry and science came on stage in four parallel sessions. During the conference I had the opportunity to present a poster of the work I have carried out during the first year of my PhD. 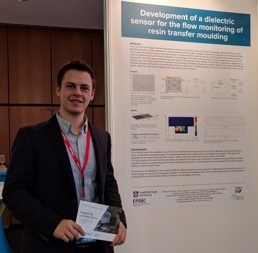 My research focuses on monitoring the Resin Transfer Moulding (RTM) process which is one of the most promising available technologies for manufacturing large complex three-dimensional parts from composite materials. The collection of the parameters that are used by current models is inadequate and therefore, online monitoring of the process is proposed to enhance the understanding of resin’s flow and cure. The RTM process is mostly used in aeronautical, automotive and wind energy applications, such as the manufacturing of wind turbine blades. The SAMPE conference supports sectors occupied with the aerospace and defence, the automotive and transport, the offshore and energy and many others related with advanced materials and process engineering. The main sessions of the conference addressed the developments on materials, like composites, new light metals and alloys. The conference was very interesting as I could notice great interest on composite materials, mostly thermoplastic materials for automotive and aerospace industry. Also, there is a push from the industry to automate manufacturing processes and this is urged by the automotive sector because of the high-volume production needs. Germany is one of the leaders in addressing the “Industrie 4.0” concept and this couldn’t be missing from this conference. I was fortunate to network with professionals who work on the “Industrie 4.0” concept and share my knowledge as the core subject of my research combines embedded intelligence with materials science and development. The presentation of my poster offered me a great opportunity to communicate and discuss the project with the leading manufacturing and advanced materials associates. Finally, this conference provided the chance to network with the scientific community and professionals and receive their insight on the state-of-the-art work. I believe attending this conference has been a rewarding experience and has enhanced my confidence for the future. 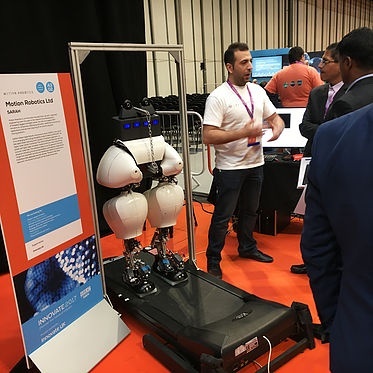 The National Physical Laboratories (NPL) in London hosted on the 30th and 31st of October the second annual conference for postgraduates students engaged at NPL and its partners universities. The conference had a really clear purpose to make all the attendees aware of the diversity of projects from different fields of expertise that are being supported by NPL. As the conference gather postgraduate students from different universities across the UK, the event was also the perfect opportunity for networking and set the path for possible collaborations for projects where different skills and science fields are needed. My participation on the NPL conference involved an elevator pitch style presentation and a poster of my project “Compact Coherent Camera for Use in Synthetic Aperture Interferometry”. I presented the developing of a set of compact coherent sensors to perform surface measurements which can be use on modular flexible configurations (1D array, 2D array or single moving sensor). The aim of my project is to build a measurement system with high-resolution and a wide field of view to characterize and detect defects on printed micro wires manufactured by the company Epigem. Even though the project is on its early developing stage, it drew the attention of the audience as a flexible imaging system could be potentially applied in a wide range of industries, from the manufacturing field to biological samples imaging. Pawel Ladosz one of CDT-EI researchers had an opportunity to attend ROScon and IROS conferences this year in Vancouver, Canada. ROScon which lasted two days on 21st and 22nd of September is a conference dedicated to Robotic Operating System (ROS). ROS is a very popular tool amongst both academia and industry to allow quick and easy integration of sensors, actuators and robotics platforms. The conference was a single track and was focused on latest development of ROS, future updates and examples of current usages. Presenters included but were not limited to guests from ETH, Shadow Robot, Clearpath robotics, Bosch and Daimler AG. IROS which took place between 24th and 25th of September is one of the most prestigious conferences dedicated to robotics research. The conference consisted of two workshop days and three conference days. It covers all fields related to robotics such as computer vision, path planning, machine learning, control and design. In 2017 2164 papers were submitted and out of those 970 papers was accepted. Speakers included but were not limited to Fei Fei Li expert in computer vision from Stanford University and Google, Dieter Fox expert in artificial intelligence from the University of Washington, Jorge Cham creator of PhD comics and Joey Durham one of the creators of Amazon robotic warehouses from Amazon robotics.